The Kirkwood residence was built by Kansas City Star founder William Rockhill Nelson for his daughter in the Rockhill neighborhood. The home also formerly housed the Rockhill Tennis Club. The Rockhill Tennis Club occupied the five-acre site at 4520 Kenwood Avenue from 1944 to 2010. The Nelson-Atkins Museum of Art had owned the property, sometimes called the Kirkwood home, since the 1950s and leased it to the tennis club. Interest was high when it was listed as a single-family residence with ¾ of an acre for $289,900. The museum plans to use the north and south ends of the property to extend its sculpture park. "It's been a long process, but we're excited about this next step," says Laura Burkhalter, president of the Southmoreland Neighborhood Association, who also serves on a stewardship committee of museum and neighborhood representatives. Caster, who's been in real estate for nearly 20 years, buys, rehabs and sells properties. But he also has experience in historic preservation, having rehabbed a 1903 Hyde Park home designed by Shepard and Farrar for George J. Myers. The Nelson-Atkins Museum of Art has sold the stone mansion at 4520 Kenwood Avenue, that previously housed the Rockhill Tennis Club. Caster estimates it will take almost a year to complete renovations to the former tennis club, at a cost of about $500,000. "We've already submitted our plans to the Historic Preservation Department," he says. "Probably some of the biggest changes would be the kitchen, bathrooms and altering the garage." Currently, the residence has no kitchen, and the bathrooms were changed to toilet- and sink-only for the tennis club. Exterior changes are already visible. Last summer, workers started tearing down the site's crumbling tennis courts. An aerial view of the tennis courts at the former Rockhill Tennis Club in June 2018. Residents from the nearby historic neighborhoods have been pleased about the changes so far. "The communication has been very free-flowing," Galen Mussman, former president of the Rockhill Homes Association, told KCUR last May. "There's just a sense of goodwill and trust." Tensions simmered between the museum and its neighbors for almost a decade, as the museum expanded to add the Bloch Building and proposed using the former tennis club for office space. It took about six months of negotiations for the museum and its surrounding neighborhoods to hammer out terms for the museum's development framework, called the Master Planned Development or MPD. 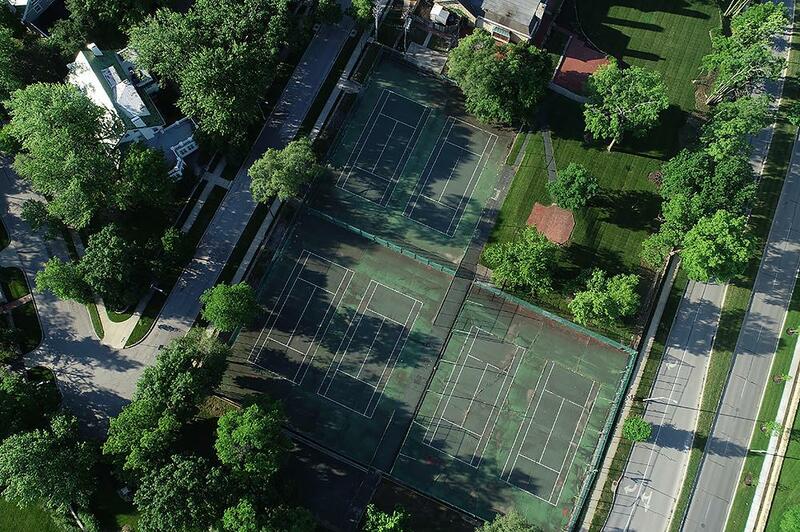 That agreement was approved in 2017 by the City Council, and the museum was encouraged to put restrictions on the sale of the former tennis club for historic preservation. Michael Cross, the museum's program manager for asset protection and facilities, said last year that the new owners will have an "amazing yard" — the parking lot will also be removed to make way for sculpture by December 31, 2020. Caster did not specify whether the family, with three kids ages 19, 17, and 8, planned to live in the Kirkwood home long-term. "We're just taking it day by day," he says. "I'm not going to rule out anything. We'd like to see how the property turns out before any decisions get made." But the two dozen members of The Nelson-Atkins Museum of Art’s Society of Fellows who’d gathered at the southern tip of the Bloch Building did not appear in search of any such thing. Just past the end point of “The Big Picture,” the Nelson’s recently opened showcase of photos from the Hall Family Foundation, the smartly dressed patrons sipped wine and listened to cocktail jazz. People don't often think about preserving the valuable things they own on paper until it's too late. But when that time comes, one Kansas City man is often able to help. Mark Stevenson is used to seeing paper in every state of disrepair. A professional paper conservator, he has spent the past 25 years restoring prints for prestigious museums both large, such as the National Gallery of Art in Washington, D.C. and The Nelson-Atkins Museum of Art, and and small like The Fogg Art Museum at Harvard. Two times every year, a group of admittedly obsessive collectors gets together for a "show and tell." And sometimes, what the members of the The Print Society of the Nelson-Atkins Museum of Art are most excited about can end up on the walls of area museums. It's been a decade since the Bloch Building began illuminating the east side of The Nelson-Atkins Museum of Art, and its architect, Steven Holl, says it remains one of his most important works. The sentiment was echoed by Time magazine in 2007, when it dubbed the structure that year's top "architectural marvel."